You will earn 2,425 Reward Points. Earn 1 reward point for every 1 dollar spent. 4” Lake-Glide® casters - all swivel, 2 each with brake. Easy-Glide ™ design provides quiet, nonstick operation. Easy field adjustment for plate height, no tools required. High-strength easy-to-clean stainless steel tubular frame. Height adjustment springs detach and attach from inside the dispenser. No need to remove dispenser from mobile unit. Mobile Frame: Mobile frame shall be of 18-gauge wall stainless steel 1” tubing. Tubing frame shall be of "U-frame" design with bottom tie bars for extra strength. Units shall have 18-gauge top and bottom shelves to provide dispenser tube stability. Top and bottom shelves shall be bolted to tubular frame. Casters shall be 4” (102 mm) diameter extra-load swivel stem type (two with locking brake). Units shall be NSF listed. 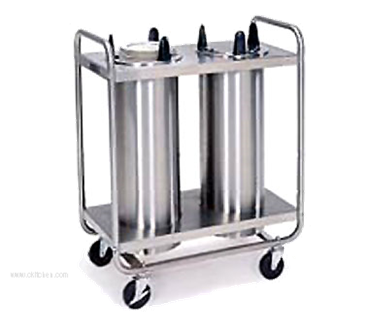 Dispenser Tubes: Dispenser tubes shall be of welded stainless steel construction and shall drop into mobile unit top and bottom shelf openings. Dispensers shall be fully enclosed in 22-gauge stainless steel, shall hang from top shelf opening by an 18-gauge flange ring, and feature three each 22-gauge vertical side supports welded to 20-gauge bottom plate. Self-leveling dish carriage shall be of welded stainless steel construction and shall travel vertically in dispenser tube with nylon guides for smooth operation. Carriage shall have 22-gauge removable dish platform. Dispensers shall feature flange mounted perimeter extension springs, which are detachable from the dish carriage without tools to provide adjustment for different weight dishes. Each dispenser shall have a vertical stacking capacity of 25” (635 mm).